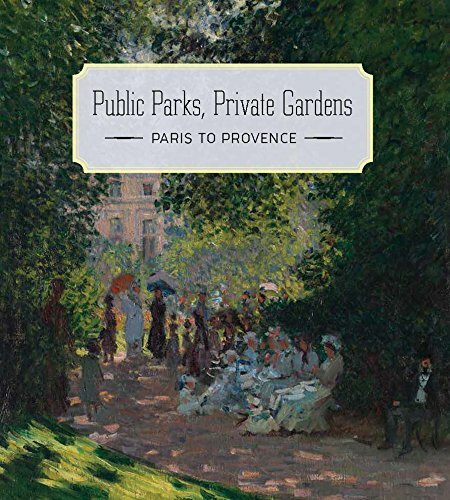 Anchored by the encyclopedic holdings of The Metropolitan Museum of Art, the exhibition Public Parks, Private Gardens: Paris to Provence, opening March 12, will illustrate the horticultural boom that reshaped much of the French landscape during the 19th century. As shiploads of exotic botanical specimens arrived from abroad and local nurserymen pursued hybridization, the availability and variety of plants and flowers grew exponentially, as did the interest in them. 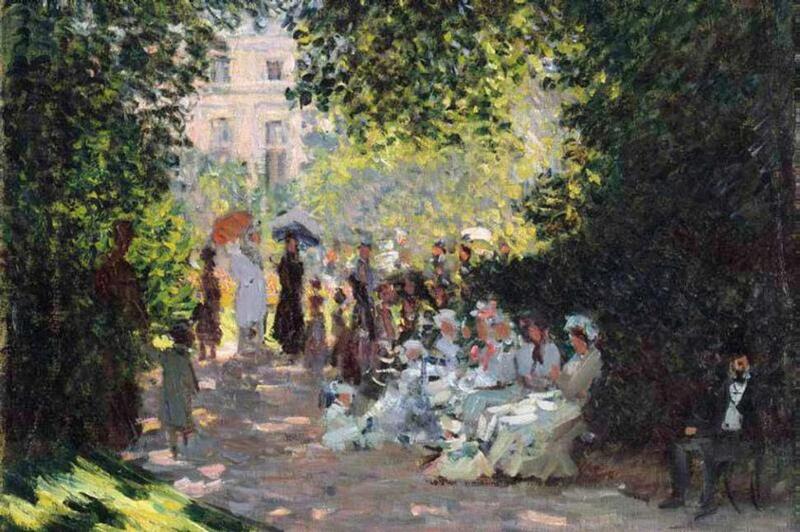 The opening up of formerly royal properties and the transformation of Paris during the Second Empire into a city of tree-lined boulevards and parks introduced public green spaces to be enjoyed as open-air salons, while suburbanites and country-house dwellers were inspired to cultivate their own flower gardens. By 1860, the French journalist Eugène Chapus could write: "One of the pronounced characteristics of our Parisian society is that . . . everyone in the middle class wants to have his little house with trees, roses, and dahlias, his big or little garden, his rural piece of the good life." 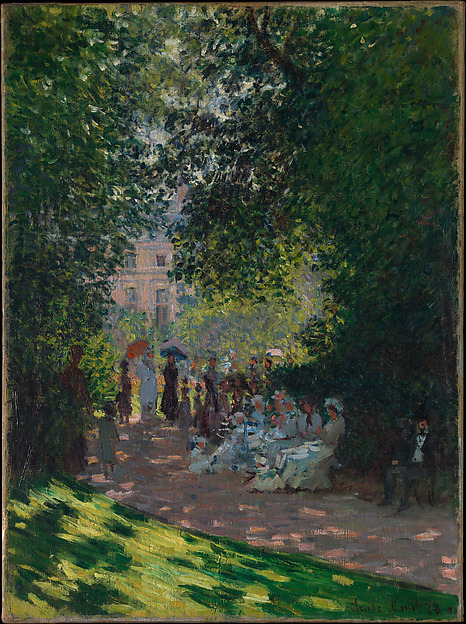 The important role played by parks and gardens in contemporary French life is richly documented in works in The Met collection by artists extending from Corot to Matisse, many of whom were gardeners themselves. The popularity of botanical and floral motifs at this time is evidenced throughout the pictorial and decorative arts. 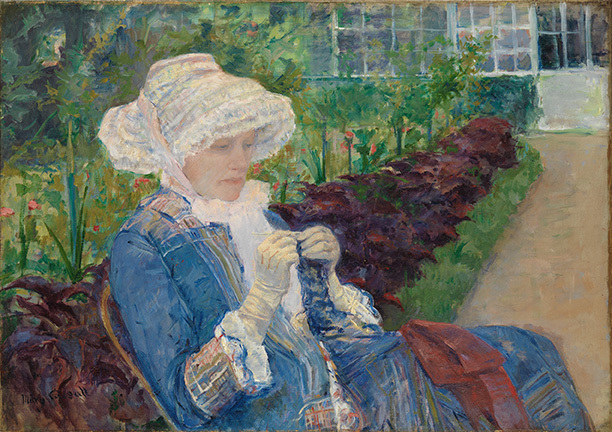 With some 150 works that range from paintings by the Impressionists to photographs of the era and vases made to display lush bouquets, this presentation will provide a fresh, multisided perspective on best-known and hidden treasures housed in a Museum that took root in a park: namely, New York's Central Park, which was designed in the spirit of Parisian public parks of the same period. The exhibition is made possible by the Sam and Janet Salz Trust, the Janice H. Levin Fund, and The Florence Gould Foundation. 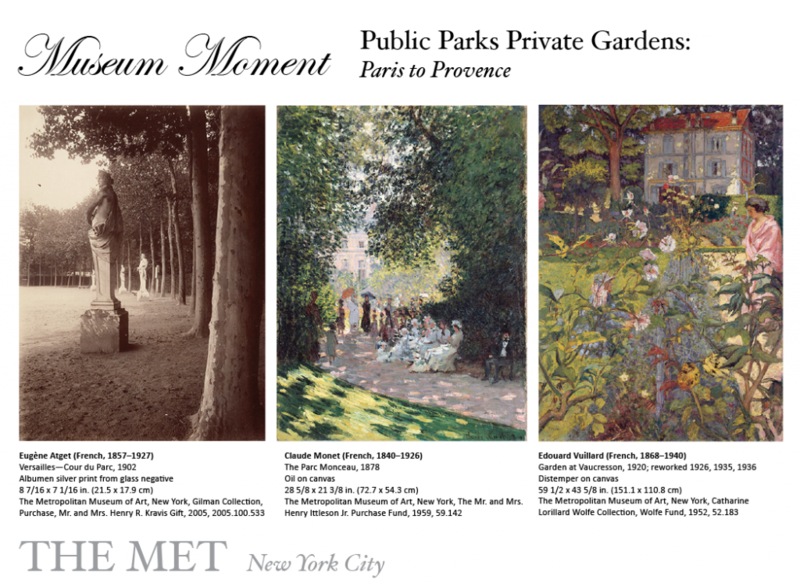 Public Parks, Private Gardens: Paris to Provence is organized by Susan Alyson Stein, Engelhard Curator of Nineteenth-Century European Painting, Department of European Paintings, with Colta Ives, Curator Emerita, Department of Drawings and Prints, and the assistance of Laura D. Corey, Research Associate, Department of European Paintings, all of The Metropolitan Museum of Art. Exhibition design is by Daniel Kershaw, Exhibition Design Manager; graphics are by Kamomi Solidum, Senior Graphic Designer; and lighting is by Clint Ross Coller and Richard Lichte, Lighting Design Managers, all of The Met Design Department. The exhibition will be accompanied by a catalogue published by The Metropolitan Museum of Art and distributed by Yale University Press.